Short on time? 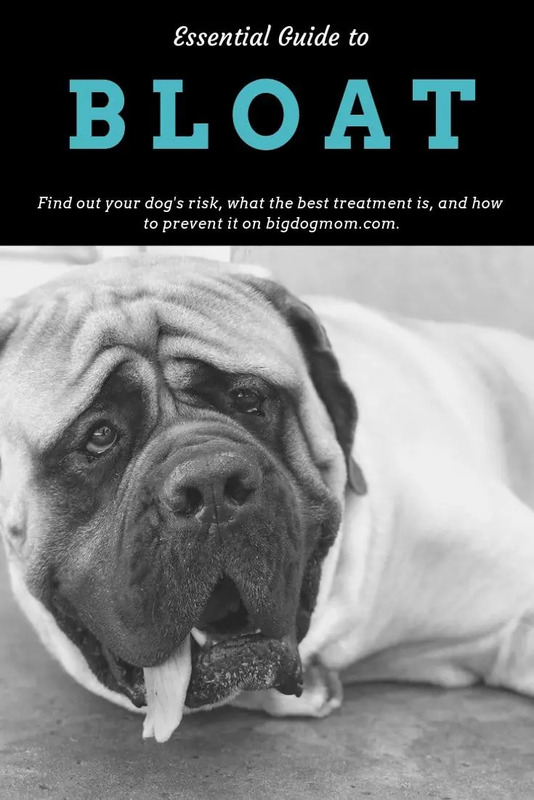 Download the Quick Reference Guide for Bloat in Dogs – a beautifully designed, one page PDF which includes the signs, symptoms, and phases of bloat and how to prevent and treat it. You will want to keep this one on your refrigerator! In its most technical terms, bloat is Gastric Dilatation (stomach swelling) and can include Volvulus (twisting). When bloat includes volvulus it is often referred to as GDV. I will use the terms bloat and GDV interchangeably throughout this post, however, keep in mind, they aren’t identical. A dog can bloat, or have an accumulation of gas, fluid or food that causes the stomach to distend, without the “volvulus” or twisting of the stomach. Commonly called “bloat” or “gastric torsion,” GDV occurs when a dog’s stomach fills with gas and twists, cutting off blood and oxygen to the stomach. As the swollen stomach pushes against surrounding organs and large blood vessels, blood flow to the heart and other organs eventually stops. Without immediate treatment, shock and a painful death occurs within minutes or hours. Bloat is the second biggest killer of dogs behind cancer. A study published in Veterinary Surgery in 1996 estimated that 40,000 to 60,000 dogs in the United States are affected with GDV each year with a mortality rate of up to 33 percent. Beyond that study, there is a consensus in the latest research that the mortality rate for dogs with bloat, even when surgery is performed, is a shockingly high 30%. Stick with me, because this information just might save your dog’s life one day. Before we discuss specific bloat causes, I want to address some more defined risk factors for bloat in dogs. Breed and anatomy. The most widely recognized and accepted risk factor is purely anatomical. You can tell a dog is going to be at higher risk for bloat just based on his or her structure. Large, deep-chested dogs that have chest cavities that are significantly longer from spine to sternum, when compared to the width of the chest cavity viewed from the front. Put simply, dogs that are narrow in width but who have a deep chest. You will see in a moment the list of dog breeds prone to bloat fit this very description. Put another way, dogs with vertical chests are more prone to GDV because the stomach has more room to turn around and stay flipped. Following Great Danes, the two most bloat prone dog breeds are the Saint Bernard and Weimaraner. German Shepherds, Akitas, and Standard Poodles are also commonly affected. In this section we will address some commonly held beliefs about bloat in dogs and share which ones are backed by science and which ones aren’t. Although the exact cause of GDV in dogs remains unknown, there has been a great deal of research over the last couple years that I think you will find extremely interesting. I am breaking this section into 6 main categories for simplicity. But before we get there, I want to address the how we got to where we are with respect to our understanding of what causes bloat in dogs. Recommendations published in veterinary textbooks, magazines, and in literature promoted by dog food companies typically include the following: feed several small meals daily, avoid exercise or excessive water consumption immediately before or after eating, slow the speed of eating, moisten dry food prior to feeding and raise the level of the feed bowl to reduce air intake. Would it surprise you to know that NONE of these recommendations have been based on sound scientific evidence, and their efficacy has never been formally evaluated? These studies took bloat dogs and asked the question, what do all of these dogs have in common? The problem with this type of study is that it is plagued by confounding. This is why prospective studies are critical! These studies are done with dogs BEFORE they bloat. All factors are accounted for in a population of dogs then tracked over a number of years. While there is still some confounding present in prospective studies, which we will talk about, the scientific evidence supporting and disproving certain beliefs about the cause of bloat in dogs is undeniable. We discussed just a minute ago the impact that the dog breed and anatomical structure have on a dog’s risk for bloat. The genetic cause of bloat in dogs I am referring to is the impact of genetics WITHIN an individual breed. In a recently completed 5-year prospective study of over 1,900 show dogs, the incidences of GDV in 7 large (50 to 99 lb) and 4 giant (> 99 lb) dog breeds were 23 and 26 cases/1,000 dog-years at risk, respectively. On the basis of findings of the present study, the strongest recommendation to prevent GDV should be to not breed a dog that has a first-degree relative (parent, sibling or child) that has had GDV. This is true. You may be breeding dogs now that appear healthy but who develop GDV later in life, but you still have control over breeding siblings and children of dogs who have bloated, don’t you? As is the case for cancer, GDV is believed to be somehow tied to the aging process in giant-breed dogs. A similar pattern might also be observed for the large breeds in a longer study since large-breed dogs age slower than giant-breeds. I have talked about this before, in dogs, body size is inversely related to longevity. This basically means that large breed and giant breed dogs will experience their highest risk of bloat between the ages of 4 and 8, with the risk of bloat in puppies being significantly smaller. Here’s where the science gets really interesting! Researchers gathered information on medical history, genetic background, personality, and diet. In fact, approximately 20% and 52% of cases of GDV among the large breed and giant breed dogs, respectively, were attributed to having a raised food bowl! This category is a little less cut and dry (no pun intended). As many of the retrospective studies suggested, speed of eating was confirmed to be a risk factor for large breed dogs. However, the same was not true for giant breed dogs in the prospective studies I read. Unfortunately, the reason for speed of eating being a risk factor for large breed, but not giant breed, dogs was not determined in any of the research I found. Here is the bottom line. Slowing a dog’s speed of eating may be effective in preventing GDV in large breed dogs, but not in giant breed dogs. If you are the owner of a large breed dog (50 – 100 pounds), you may consider using a slow feeder food bowl like this one. In my research, I was selfishly trying to find the proclamation that raw dog food diets are linked to a reduction in the incidence of bloat in dogs. Selfish because I am a raw feeder and I would love nothing more than to add a reduction in risk of bloat to my list of reasons why. What I did find was this. Retrospective studies found that dogs fed only dry dog food or foods containing kibbles < 30 mm in diameter were at increased risk of developing GDV. Prospective studies have not confirmed dry kibble or kibble size as a cause of bloat in dogs, however. In the 5 year AVMA study of over 1,600 dogs, temperament was measured by dog owner assessment. As someone who has dedicated considerable time into the subject of canine temperament, this finding was of particular interest to me. My mind immediately jumps to the impact behavior-based breeding decisions might have in the overall rate of bloat or GDV in big dogs. Facts first. There are three phases dogs go through when they bloat. In this phase, the stomach will start to dilate (gastric dilation) and the stomach begin to twist (gastric volvulus). A dog will present as “off,” anxious, pensive, restless. Unproductive vomiting is common and only produces a white foam. The dog’s abdomen may or may not be swollen during this phase. Due to the dilation and twisting of the stomach, blood supply to the stomach gets cut off. The primary veins to the heart and liver are compressed and twisted. The spleen becomes engorged. Shock begins to develop. The stomach tissue during this phase is damaged. Due to the lack of blood flow, the spleen and stomach tissue become necrotic (dead). In this phase the shock is severe and irreversible. Heart failure develops and death is imminent. Here is a comprehensive checklist of possible bloat symptoms for your reference. Gagging, coughing, vomiting or attempting to vomit. Can appear as unproductive or dry vomiting or vomiting up white foamy mucus. May occur in 5-30 minute intervals. Abdominal swelling, may feel tight. Want to save this information? Download your Quick Reference Guide for Bloat in Dogs now. I wanted to share the facts about GDV first. The bloat symptoms in dogs from a physiological point of view. 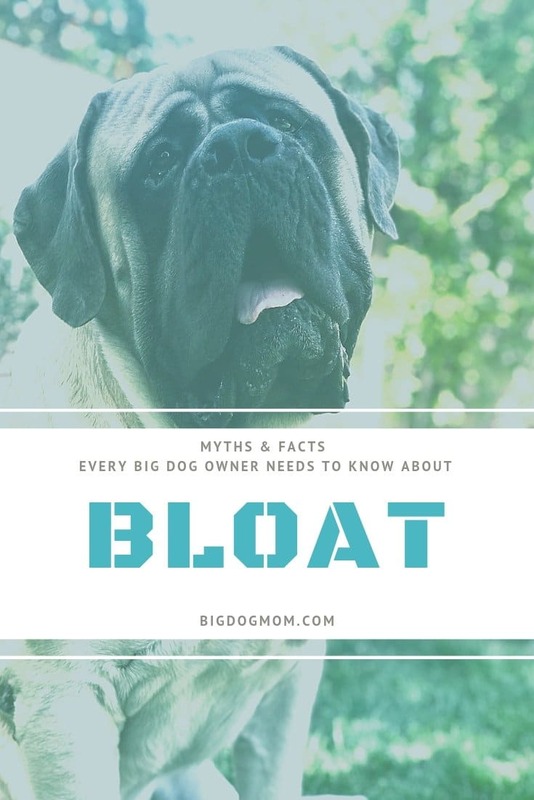 But to illustrate what bloat can look like for the average big dog owner like you or I, the following are a few personal stories from members of the Big Dog Mom Community. “The first sign I saw was my [Great Dane] was acting uncomfortable. Then they look back at their belly. Then you start to notice the belly distending. I was working for a vet clinic at the time, so I knew immediately what the problem was. The first time, my dog was pretty bloated already when we got to the vet office. He went immediately to surgery, but didn’t make it off the table. He was about 6 1/2 years old,” says Katrina. And lastly, Kaleigh shared this story about her Pyrenees mix. “she spontaneously started retching and distending. The most shocking thing to me was how much she was drooling… she couldn’t even swallow her saliva. She was shaking with pain and tried to slink away from me with her head and tail down and drool streaming out of her mouth… it was heartbreaking.” Thankfully, with surgery, this Pyr survived. Kaleigh states she will be doing the gastropexy when her girl is spayed. The next section is NOT a recommendation to keep your dog at home if he is bloating. Quite the contrary! If you suspect your dog is bloating, the very FIRST thing you should do is call your vet (or an emergency vet) and let them know you are on your way! Time is of the essence! However, in this section I want to share a few additional thoughts regarding additional tools you have in your toolbox beyond the obvious of seeking immediate veterinary care. These are things you can do to help save your dog’s life WHILE you are getting him to the veterinarian. These steps can buy you time. If you have never heard this word before, you aren’t alone. You may know it by its brand name of Gas-X or Phazyme. Remember in the beginning when I told you that bloat occurs when there is an accumulation of gas, fluid or food that causes the stomach to distend. While simethicone does not stop gas bubbles from forming, nor does it eliminate these bubbles, once they’ve formed., it helps accelerate this process of eliminating the gas from your dog’s body.. By hastening the exit of the gas, your dog will feel less bloated and more comfortable. It accelerates the expulsion of gas by reducing the surface tension of the gas bubbles. But because simethicone lowers the surface tension of these bubbles, they readily combine with other small bubbles. The larger bubbles that result are propelled through the intestines more rapidly, which allows them to be expelled out more easily. Simethicone works rapidly, and the results can usually be seen (well, heard or smelled) within minutes. How Much Gas-X (Simethicone) Can I GIve my Dog? Simethicone is very safe for dogs. It is not absorbed into the bloodstream and is usually well tolerated at unusually high doses. Up to 8000 mg has been given to dogs without causing side effects apart from a loose stool, which is why many choose a “better safe than sorry” approach to this medicine and give very large amounts whenever they think their dog is bloating. I recommend all large breed and giant breed dog owners keep simethicone on hand for an emergency home treatment for bloat. Depending on the size of your dog, you may want to give 2-4 180mg capsules or a chewable form of simethicone. Another option is a product called Bloat Buster, which is a liquid form of simethicone. Remember, simethicone is NOT a replacement for going to the vet! This is something you can give your dog that will buy you time while en route. What is a Bloat Kit for Dogs? A bloat kit includes a series of products that when used in combination, can buy your dog time if he is bloating. Let’s now discuss what goes into a bloat kit and how you would use it. If you want to see or buy a commercial bloat kit, click here. Nature’s Farmacy is where I bought mine and I highly recommend them. In the kit I have this is a block of wood with a hole drilled through it. This can be as simple as a hard tube like a PVC T connector. It really doesn’t matter what you use. The objective is to keep the dog’s mouth open so you can insert the tube. You can use a strip of cloth, a roll of vet wrap, or any type of bandaging or tape that you can wrap around your dog’s mouth to hold the block or tube in place. You can use generic personal lubricant for this. Just fill a couple small tubes or bottles with it and keep it in your kit. This is to lubricate the tube before insertion. You can usually buy this by the foot. Get at least 4-5 feet of tubing or more depending on the size of your dog. I will show you how to measure how much tubing you will need the the Facebook Live Workshop below. You will want to measure this now and cut your tube (and melt the ends to soften the edges) so that it is ready to go in your kit should you ever need it. And to help you with putting together your homemade bloat kit, I have compiled all of these items in a special section of my Amazon Shop here. What to do if you suspect your dog is bloating! Facebook Live Workshop: What is a Bloat Kit and How do you Use it? One of the best ways to prevent an at-risk dog from developing a GDV, is performing a prophylactic gastropexy. This is a surgical procedure which involves surgically attaching the stomach to the body wall, thus preventing the twist, or volvulus. Dogs which have a gastropexy can still “bloat” or have a stomach that gets large, but it cannot twist, which causes the most life threatening problems. If you have a bloat-prone dog, but are undecided about gastropexy, the surgery may be worth considering. 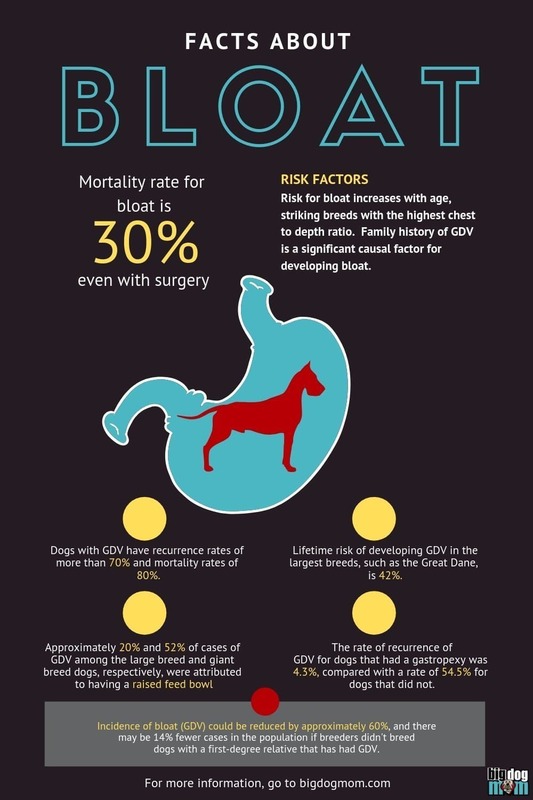 Studies show dogs with GDV that don’t undergo a gastropexy have recurrence rates of more than 70% and in those recurring events, mortality rates of up to 80%! Think of it this way, a prophylactic gastropexy is not a fix, it is just a safety net to buy you the valuable time you need to get your dog emergency veterinary care. Because, bloat in dogs, with or without a gastropexy, is an emergency situation. And lastly, are the logical questions of the best time to perform a gastropexy surgery and how much a gastropexy will cost. Timing is easy. The best time to do a prophylactic gastropexy is at the time of spay or neuter. Cost is a little more nebulous. One consideration is that emergency GDV surgery costs will be at least two-and-a-half times the cost of preventative gastropexy. And with pet insurance, like Embrace Pet Insurance, you may be able to have all or part of the cost of gastropexy covered. I know that on the Wellness Plan for Embrace, they do cover prophylactic gastropexy. If you have a different insurance, it may be worth a phone call to find out what your out of pocket expense would be for this type of surgery. Know your dog’s family history of bloat. Consider gastropexy if your dog has a first-degree relative with a history of GDV. Add bloat to your list of questions for prospective dog breeders you interview the next time you are buying a puppy. Be mindful of what you are feeding – While dry kibble diets are not being implicated based on current research on bloat in dogs, it seems to me dogs at the highest risk for bloat would benefit from a raw or fresh food diet. In addition, if you have a large breed dog who is a fast eater, consider investing in a slow feeder food bowl that will slow him down. Do NOT use this for a giant breed dog. Do NOT use a raised food bowl for ANY large breed or giant breed dog. Have your dog’s veterinarian and an emergency veterinarian pre-programmed into your phone. Time is of the essence! If you suspect your dog is bloating, you MUST act FAST. Fumbling around on Google or in your bottomless pit of a purse to find the phone number for your vet will cost you time. Time you do not have. Do this today. Do it NOW! Download your free Quick Reference Guide to Bloat for Dogs – a comprehensive, one page guide which includes a list of at risk breeds, signs, symptoms and phases of bloat, as well as how to treat and prevent bloat. This guide is a MUST have reference for all big dog owners! Get Pet Health insurance. I have written extensively about the financial responsibility of large or giant breed dog ownership. This includes the cost of the dog, preventive veterinary care, food, and more emergent issues like the cost of GDV surgery. 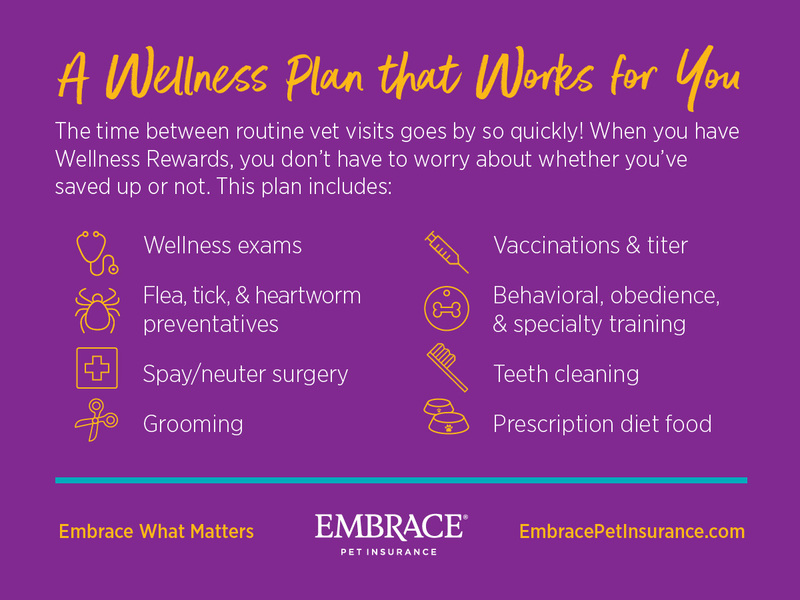 And if you are interested in gastropexy, the only pet insurance that I know of that covers the cost of this surgery is Embrace Pet Insurance under their Wellness Plan. Definitely check them out! In preparation for writing this post, I reached out to the Big Dog Mom Community and did a poll. I asked big dog owners how many of them had experienced bloat or GDV in any of their dogs. In less than 24 hours, 93 big dog owners chimed in, with nearly 30% of them having one or more experiences with bloat in their dogs. 30%! And while that is a shockingly high percentage, I wonder what percentage of those that answered “no” would be prepared if they were suddenly faced with this crisis? Make your first step in preparation, sharing this with a big dog friend. This was amazingly informative, Stephanie! Thank you!!! Wondering if you found any statistics of bloat in small (<40 pounds) dogs? Thank you, Kristin! You know, that’s a great question. I did find that some smaller breed clubs are paying for research – breeds like Basset Hounds and Corgis. But the research studies that have been done that I used for this post were all done in large breed and giant breed dogs. And when you think about the anatomical and genetic risk factors for bloat, it makes sense that the focus has been in these breeds not smaller ones. The biggest surprise for me is the raised bowls. We’ve had raised bowls for decades, now I have to wonder if we need to start feeding from the ground. Excellent post, thanks for all the detailed information. I pray we never experience bloat with our dogs, but it’s great to be prepared just in case. Thank you so much, Debi! I agree with you. While I don’t use raised bowls with my current dogs, we raised Great Danes growing up, and they were always fed from raised food bowls. It was accepted as just the way big dogs are fed years ago. I never questioned it until recently. Great post Stephanie! Very thorough information about bloat. Thanks! Aw, you are very welcome, Judy! So nice to see your name in here!